Zank Boutique Hotel, Salvador, Brazil details from BrazilBookers.com. The Zank Boutique Hotel, an elegant and upscale hotel, is located in the historic and vibrant district of Rio Vermelho in Salvador, Brazil. The famous Praia da Paciencia is also just at a walking distance. The hotel has been designed by a famous French designer of Brazilian descent and you can feel the difference and elegance as soon as you enter the hotel. The Zank Boutique Hotel boasts twenty guest room in total, all of them obviously very tastefully designed and furnished. The hotel exhibits a perfect combination of classic beauty and modern design. The building itself is more than a century old and some of the furniture are classic. What would you expect from a 5-star hotel that has been done up by a talented Brazilian-French designer? Obviously, a classic façade and a chic décor, owned as it is by three sisters who do not lack in glamour themselves. 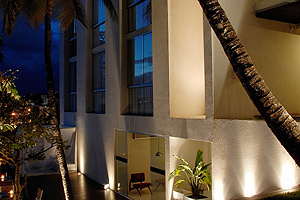 The Zank Hotel in Salvador is a swank hotel, consisting of twenty stylish apartments. The fastest route to this hotel is via the Salvador Luis Eduardo International Airport, just 25 km away. You can either get into a taxi for the 15-minute journey, or hire a car at the Airport yourself for the duration of your entire stay. Located in the Rio Vermelho neighborhood of Salvador, the Zank hotel offers a view of the ocean from almost every apartment. After all, Praia da Paciencia is within walking distance. The wooden-floored, air-conditioned apartments are categorized as Classe (with a bath) and Estilo (with a shower), and divided among the contemporary building and the century-old residence. The large windows are very prominent, considering that they allow sunlight to flood into every room. King-sized beds dominate, with sheets of Egyptian cotton and soft pillows filled with goose feathers. Marvelously designed by local artists, the furniture ranges from the neo-classic to Baroque—cutting-edge technology has been used. Other comforts offered are WiFi Internet access, phone, cable/satellite television, a mini bar, CD player, and a safe box. These facilities are available for the disabled too. Room service is offered by a competent and charming hotel staff. There are many hotels scattered across Brazil, but what sets the Zank hotel apart is the presence of an Infinity Plunge Pool on the roof, as well as a separate spa area. 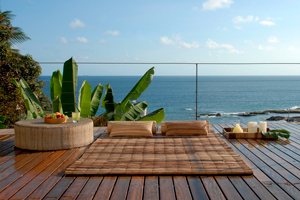 The Deck area is for sunbathing, as well as for watching the sun going down into the ocean towards evening. The on-site restaurant dishes up Bahian and French menus, apart from purely vegetarian dishes. Breakfast is complimentary. After a meal, you may take a stroll in the garden outside. Other amenities you can take advantage of, are the outdoor swimming pool, bar in the lounge, reading room, tennis, gym, sauna, hot tub/Jacuzzi, and two treatment rooms for in-house massages like Shiatsu, Gommage and Hot-stone. The ocean front is great for early morning jogs or walks. If you desire to explore the other beaches, get hold of a taxi or use public transport. Tour the historic Pelourinho District with its colonial architecture and cobbled streets. Watch the ceremony of Candomble, a conglomeration of African and Brazilian rituals, the martial art of Capoeira and ritualistic African-based dances. The Acaraje da Dinha is a superb restaurant, providing traditional cuisine. Night life is boisterous. And if you should be in Salvador during Carnival time, then you are in for a gala time. When would you like to stay at Zank Hotel ? 1) Rates at the Zank Hotel may not be valid during Carnival, New Years, Easter and other special dates. © Copyright Bookers International, LLC. 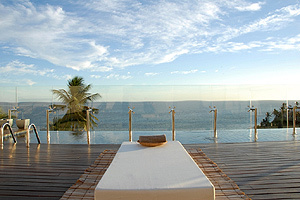 All Rights Reserved – Information on Zank Boutique Hotel, Salvador, Brazil details from BrazilBookers.com.